A memoir that offers reasons for optimism about America’s political future. Reflecting on his 50-year adventure in politics, Green (Losing Our Democracy: How Bush, the Far Right & Big Business Are Betraying Americans for Power & Profit, 2006, etc.) offers colorful anecdotes, gossip, and savvy critiques to support his contention that liberalism is on the rise. 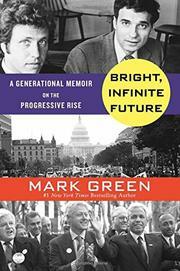 “In my view,” he writes, “if liberal values were a stock, now is the time to buy.” The author believes that movements from the 1960s—“for civil rights, peace, women, gays, environmental justice, health care for all, corporate accountability, and consumer justice”—are shaping current politics, with a resurgence of the kind of progressivism that attracted him to Ralph Nader, with whom he worked for a decade; propelled him to run for the Senate and mayor of New York (he lost both races); and fueled his lifelong advocacy work. He served as commissioner of consumer affairs under Mayor David Dinkins and twice as public advocate. A familiar radio and TV personality, Green appeared on Larry King’s shows; sparred with William Buckley nearly 100 times on Firing Line; and founded Both Sides Now, a radio show currently airing nationally. A seasoned campaign worker for Gary Hart, Bill Clinton, and John Kerry, Green summarizes a series of skills essential to winning: be relentless, always optimistic, unwaveringly disciplined, calm, smart, friendly, and a good listener. He also advises finding a voice that’s “distinctive, i.e., your brand”; balancing egotism and empathy (Hillary Clinton’s “big heart is not a tactic but a trait,” he adds); finding a strong mentor; raising enough money; and knowing when to retreat. Looking ahead, Green’s “to do” list for Democrats includes “vivid progressive counterattacks” to conservative tactics. Because of changing demographics and “the GOP lurch into fringeland,” he predicts a strong victory for Democrats in 2016. In the race between “hope and hate,” Green’s informative historical memoir shows him to be firmly on the side of hope for America.